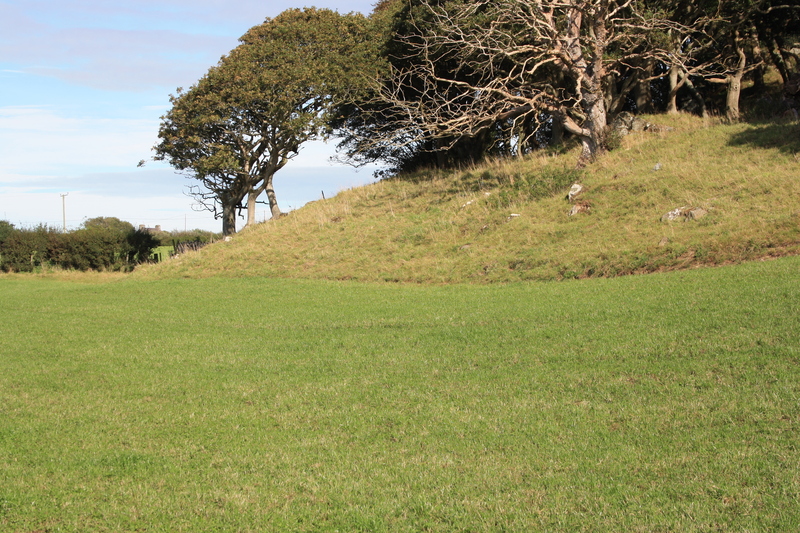 Ffynnon Faglan, St Baglan’s Well, once stood overlooking the Menai Straits a couple of miles south of Caernarfon. It was a well to rival that of St Cybi at nearby Llangybi, indeed saints Baglan and Cybi are said to have met beside it to chew over the gossip of the day. 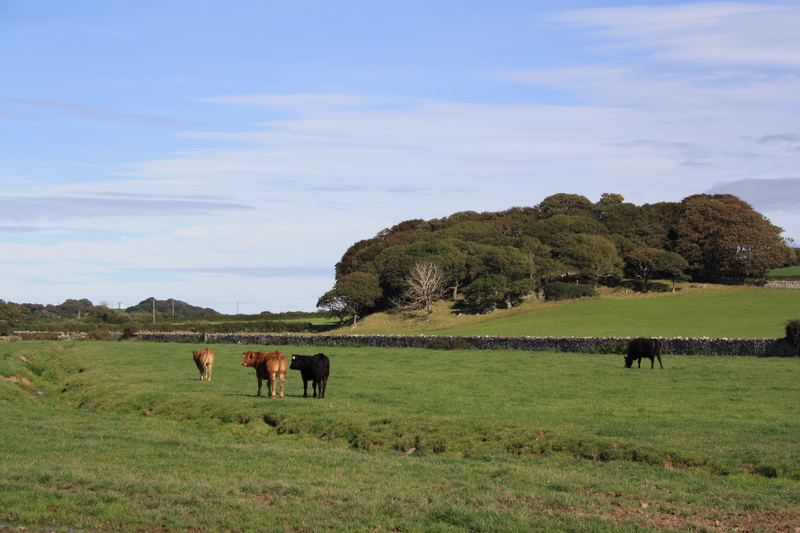 Today, however, nothing remains at the site but a flat, level field grazed by cattle. Baglan (and there were two St Baglans by the way, this is the north Walian guy rather than the other one commemorated at the village of Baglan near Neath) was one of a family of saints, he founded his cell at what is now Llanfaglan before heading off with St Dyfnog to Bardsey island in the late sixth century. The church dedicated to him stands padlocked in the middle of a field, no more than a stone’s throw from the sea. It is abandoned now and left to the care of the Friends of Friendless Churches charity. It is considered most unusual in that there is no evidence of a road ever having led to it, the sole access being the muddy track through the field. I think that weddings are still occasionally celebrated there so long as the guests are happy to arrive in their wellies. The well was once a significant structure. Rhys states that in terms of its construction it was an imitation, though on a smaller scale, of St Beuno’s Well at Clynnog. A stone built bath measuring around 6 feet by 3 feet was surrounded by a stone wall with seats built into it. There were recesses in the walls on the north and east sides. This description matches that from Hughes and North’s Old Churches of Snowdonia published in 1924 which suggests that the well was still visible for the first part of the 20th century. The enclosure, 9 feet by 8 feet 6 inches externally has now been filled for the protection of cattle. It isn’t until around 2010 that there start to be reports that the landowner seems to have removed all the stone from the site and the last remnants of this once impressive well have vanished. Only the grid reference on the map now gives any clue to where it once stood, at the foot of this small hillock. Its location does live on in the name of the adjacent woodland Coed y Ffynnon – Well Wood. 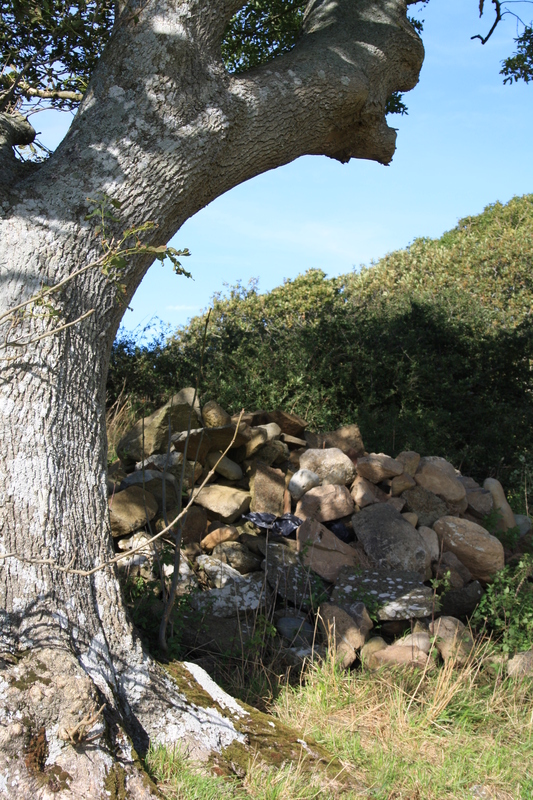 There is a heap of large stones piled up beside an old tree on the hilltop (shown in the little picture at the top of the post) – we just wondered whether these represent the final remains of Ffynnon Faglan? The gradual decline and disappearance of Ffynnon Faglan over the last century from the disruption of the water supply to the infilling and removal of surface evidence is a sad story that has been repeated at a number of once important local landmarks across the country, that through lack of any protection are rapidly fading from view and memory. There are many others that have suffered a similar fate, and many more that will soon follow if more is not done to help them survive. 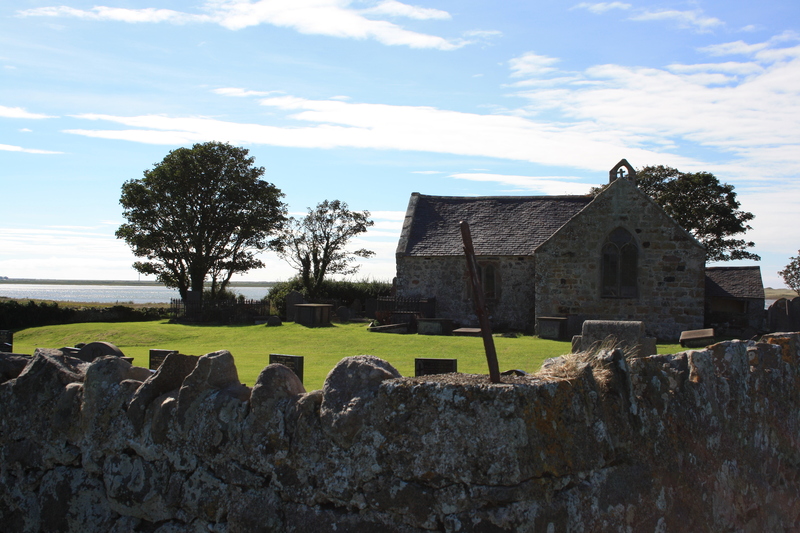 I often go along the road by the Straits and visit ST. Faglan’s church – so isolated in it’s field – but always locked. One day(quite a few years ago) I went in search of the well-it’s on my map – and was standing in the field(where it should have been) looking in vain for it. 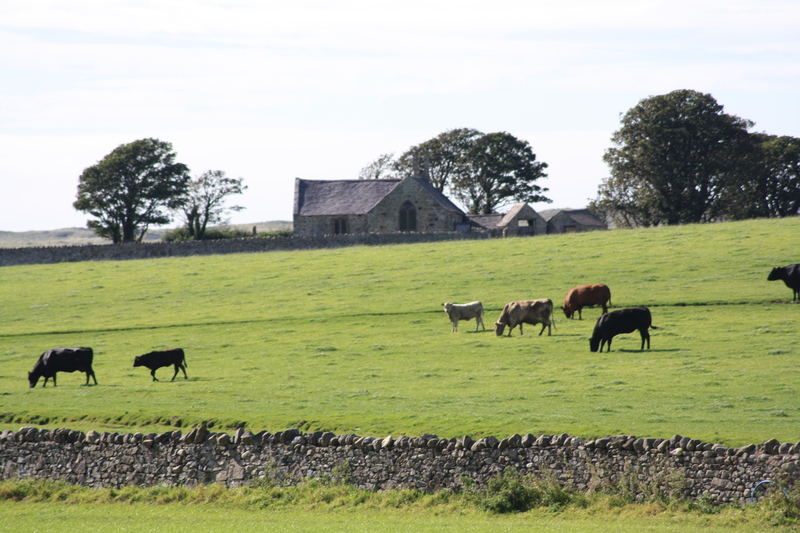 The farmer came up and asked what I was doing – I guess it looked suspicious- and he said ” Oh yes it was there, but it was filled in years ago because of the cattle being at risk of falling into it” He seemed to remember it. It’s quite disappointing isn’t it to see absolutely no sign of what was a very special well? I do enjoy your notices about North Wales wells – even the one near ST. Melangell’s church. Very many are quite new to us – so it’s exciting to go and look for them. Very best wishes, Jean and Chris in Chester. Hi – thanks for your comments – it’s a shame about the church, from the photos I’ve seen it looks interesting inside. I know there is a note in the porch about key holders, but I’m not sure where the addresses were and would have been a bit of a trek to go get a key come back, take it back etc etc – but sadly i suppose there isn’t much else they can do. Pity too about the well- if it had survived it would have been quite a sight and a valuable addition to the local visitor trail. Sadly there are many that will soon follow it into oblivion, so I suppose we need to see them while we can. Diolch yn fawr iawn – I would love to see inside, I shall do so next time that I’m in the area.